Google Maps’ estimated travel durations can be immensely useful when planning for a trip, but the predictions can be misleading when you didn’t anticipate spending half an hour simply finding somewhere to park once you arrive at your destination. 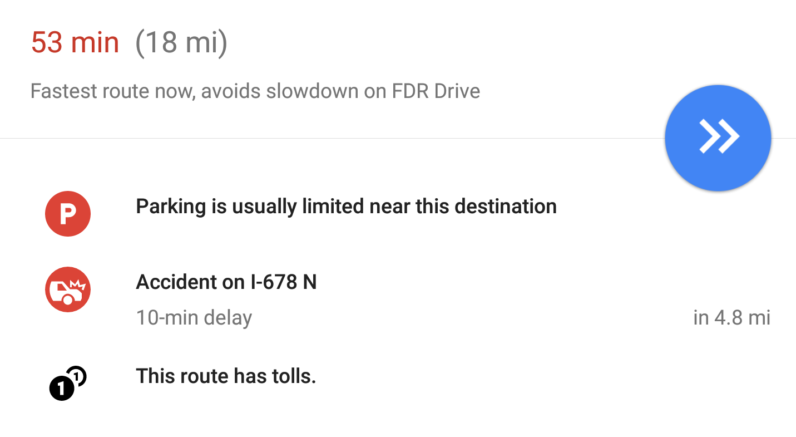 Now Google is testing a feature which warns you about limited parking around your destination, as noted by Android Police. Basically, you’ll probably be warned if you’re driving anywhere within Manhattan. The warning shows up first as a little ‘P’ icon next to your time estimate, and you can view a bit more detail by swiping up to view the directions. Despite my New York City woes, there are actually three color-coded warning levels: Limited (red), Medium (blue), and Easy (I’m guessing green, but I’ve yet to see it). That being said, the feature isn’t as useful as it could be right now. Google doesn’t provide an estimate for how long it will take you to find parking, nor suggest alternative locations for your to park. That means that in a city where parking is pretty much always scarce it probably won’t be very much help. Also, right now it seems to be mostly limited to major metropolitan areas where parking is already on the tight side. But hey, I’m not really complaining; it’s a reminder to factor in some extra time, and I wouldn’t be surprised to see parking advice added over time. The feature appears to be rolling out slowly to Android users on the Maps beta (you can join from the app’s page on the Play Store). You’ll want to make sure you’re running the latest beta build, though at this point it’s probably only a matter of time until it becomes available for more users.